NEW! Delicious semi-moist, natural fish treats containing 70% white fish with Devils Claw, Turmeric and Oleogrape to help support the joints.. 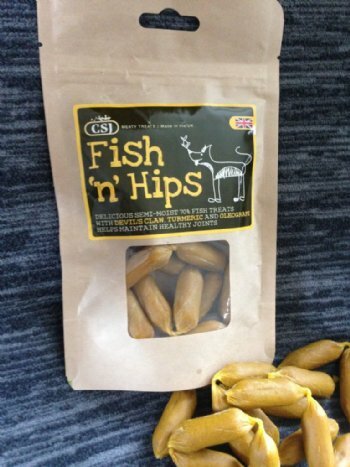 Highly palatable and low in fat so perfect for older and/overweight dogs. Air-dried for extra flavour. Ideal for reward. Recommend feeding 1 'Fish 'n' Hip' per 10kg bodyweight dog per day. Size of pack: 100g. "My 2 Border Terriers love these!" Review: I tend to slice them up and use as treats rather than give them whole sausages - my 2 BTs go nuts for them either way! I like that they’re full of goodness for them. Review: My Collie loves these, I use them as treats for training, and for giving her tablets, and also chop them up on top of her kibble just to add something different and she eats them up every time.